The protesting students began gathering in groups on the campus immediately after the President’s announcement. 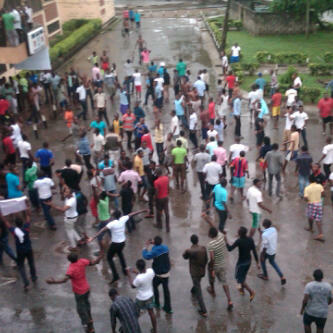 They marched out of their hostels and gathered at the YABATECH junction from where they moved round the school chanting protests songs denouncing the name change of the school. 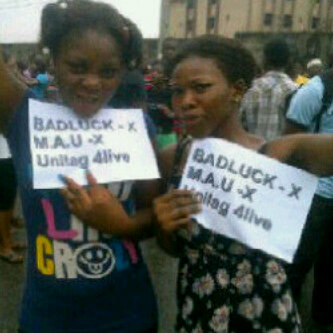 They were seen carrying placards with inscriptions: Reverse or Resign, UNILAG cant be called MAU! etc. 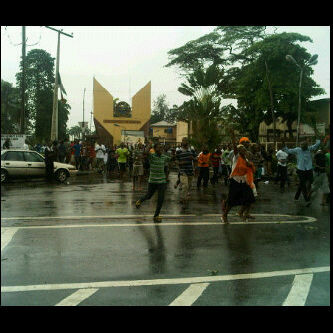 They also blocked access to the institution and disrupted traffic on University of Lagos Road and St. Finbarrs’ College Road. Let’s hope the name change issue is settled amicably before it escalates into a violent riot. President Goodluck in marking this years’s Democracy Day, changed The University of Lagos (UNILAG) to Moshood Abiola university. 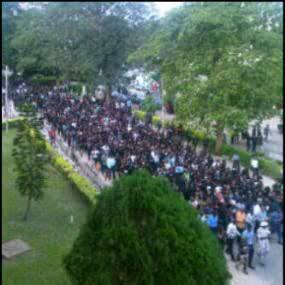 In protest,hundreds of students of UNILAG have taken to the streets to protest the name change. 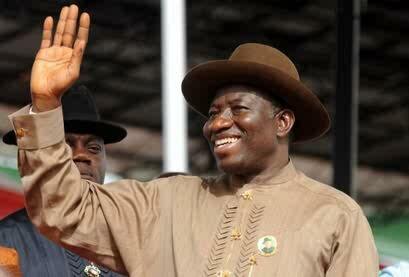 Trust our dear president to throw surprises at the citizens of Nigeria. The country is still mourning the loss of lives of the people who took to streets to protest the unceremonious removal of fuel subsidy and now this. Its high time our dear president realized that there are consequences that come with such a rash decision. 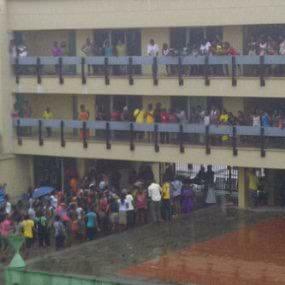 From UNILAG to Moshood Abiola University:Happy Democracy Day! As part of the president’s speech on Democracy Day, the president have renamed the University of Lagos to Moshood Abiola University,Lagos. The university is named after the slain presidential aspirant,Moshood Abiola who was said to have won the annuled June 12 election of 93′. The president in his Speech this morning, annouced the building of a new museum center for the past Nigerian presidents. The Museum would also have their history and works. Chinua Achebe’s classic novel, ‘Things Fall Apart’ has been named one of the ‘50 Most Influential Books of the last 50 years’. A group called ‘SuperScholar’ made this selection, naming Achebe’s first novel which was published in 1958 and translated to more than sixty languages as one of the 50 most influential books among books by other world acclaimed writers. Other novels on the list include Toni Morrison’s ‘Beloved’, Salman Rushdie’s ‘Satanic Verses’, Joseph Heller’s ‘Catch-22′, and Gabriel Garcia Marquez’s ‘One Hundred Years of Solitude’. 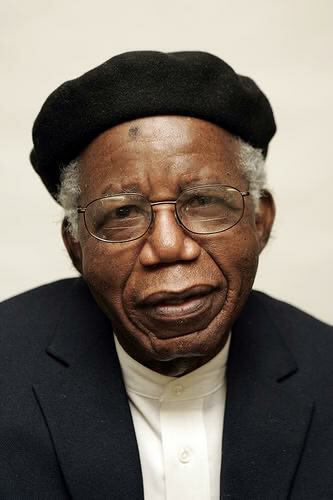 Achebe, who is the David and Marianna Fisher University Professor of Africana Studies at Brown University in Providence, RI, is the author of five novels, several volumes of poetry as well as essay collections. His latest book, ‘There Was A Country: A Personal History of Biafra’, will be published in September, 2012. The government of Kwara state have set plans in motion to immortalise the late iconic football player,Rashidi Yekini. 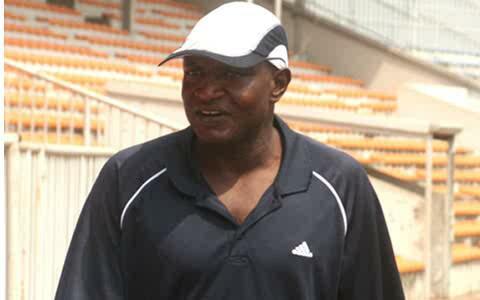 The kwara state govt wants to name a football stadium in the state after the late Rashidi. This motion is however still on the floor of the House of Reps waiting for a nod of approval. Right step in the right direction. But while paying homage to the dead,the living should not be left out.He left behind a family. A bomb have gone off in Taraba state,close to the police head quarters, this morning.The bomb was said to have been targeted at the commissioner of police convoy. 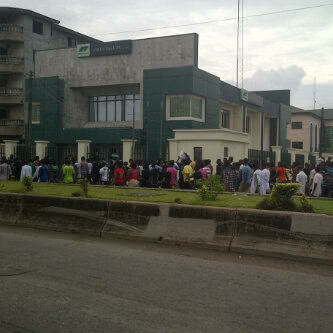 Three feared dead. Road side shop owners and okada riders are said to be greatly affected by the blast. A section of the state Ministry of Finance was also blown off by the blast. Police have condoned off the area. 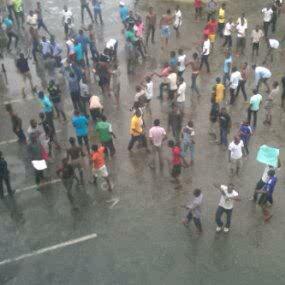 Nigeria Red Cross Society are currently administering first aid to the injured. 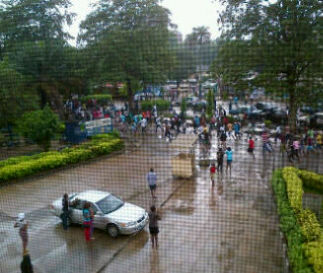 Just yesterday,being a Sunday,Bayero university kano was attacked. 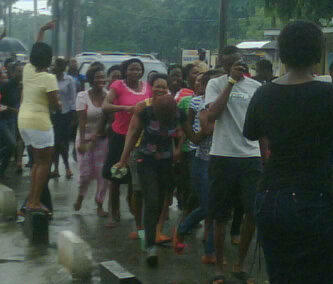 The attack was targeted at worshipers who had gathered at the university’s lecture theatre for sunday service. Two professors plus at least 15 have been confirmed dead from yesterdays attack. Today’s bomb blast would be the second attack this week. The cell-phone of the suicide bomber that attacked the office of ThisDay in the Jabi area of Abuja on Thursday have been discovered. The charred phone was among the items that were picked up by security agents, who examined the remnants of the Isuzu Sports Utility Vehicle used by the bomber in carrying out his deadly mission. Apart from the phone, bomb fragments and other clues were extracted from the wreckage of the vehicle for forensic analysis. A forensic analysis of the SIM card content would be done to provide clues to the identity of the bomber and the conversations that he might have had with his accomplices and sponsors before setting out for his target. That is if the SIM card hasn’t been totally damaged from the inferno. The government was said to be disappointed with the security agencies over Thursday’s twin attacks on the offices of the This Day and The Moment newspapers, especially the attack on Abuja, which showed that security in Abuja was not as water-tight as the security chiefs had claimed. 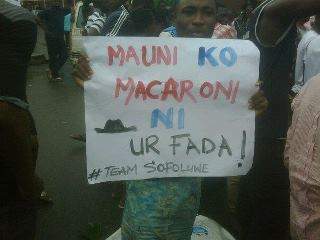 How disappointing since SSS and NASS received intel on impending attacks on FCT via the US Embassy in Abuja. Nigeria has never being much for Forensic investigation so this is a welcomed development.